The development of bacterial infections on and around biomedical materials, ranging from hip implants to wound dressings, is a large and growing problem. Biomaterial-associated infections are challenging to treat because bacteria tend to form colonies, called biofilms, which act as a safe haven for bacteria to grow and multiply. These biofilms are hard to remove as bacteria become encased in a network of polymeric chains, which act as a barrier to antibiotic treatment. Moreover, the metabolism rate of bacteria decreases inside the biofilm, therefore making bacteria less susceptible to antibiotics. Thus the development of biofilms often necessitates the removal of the biomaterial, increasing patient discomfort and treatment cost. Prevention of bacterial colonization of surfaces at early stages, when the first few bacteria begin to attach to the material, is therefore crucial. Yet, the cascade of processes that occur as bacteria begin to adhere to a surface is complicated and poorly understood. Fig. 1. (Top) Confocal scanning microscopy images of polymeric film with bound fluorescent probe exposed to different pHs. Fluorescence increases as pH decreases. (Bottom) Confocal scanning microscopy images of polymeric film with bound fluorescent probe exposed to Staphylococcus aureus for four hours. 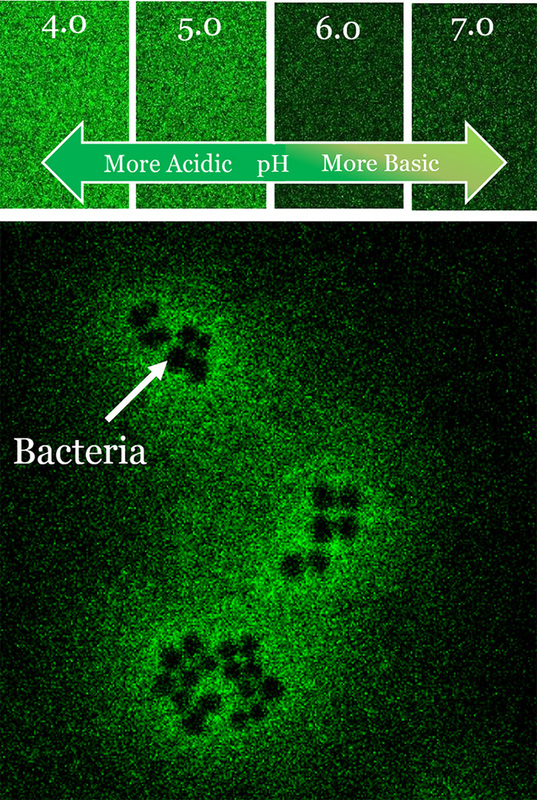 Bacteria (black dots) are surrounded by green halos of increased acidification. In this work, we sought to understand how to use bacterial metabolism to prevent bacterial colonization of surfaces. Several different types of bacteria are known to release acidic components when bacteria are grown in solution but it remained unclear whether a similar, local process occurred at the surface. To study the local pH at the surface, a pH-sensitive fluorescent dye was attached to a polymeric film which was used as a substrate for bacterial adhesion. By monitoring the fluorescence of the probe, we showed that both gram-negative Escherichia coli and gram-positive Staphylococcus aureus locally acidify the area around them, as can be seen by the green halos in Figure 1. These bacterial strains are important because both are known to form biofilms on biomaterial implants and devices. The demonstration of localized bacterial acidification was then used to trigger highly localized, on-demand delivery of antibiotics. To that end, the coatings were designed to retain drug loads at neutral pHs, and release them only in an acidified environment associated with the presence of bacteria. To explore local acidification as a trigger to release antimicrobial agents from surfaces, we have created ultrathin antibiotic-hosting, pH sensitive coatings. These coatings did not release antibiotics in large amounts of buffer at neutral pH, but were very efficient in killing bacteria on surfaces, preventing the development of a biofilm. This work opens the door to generating future biomaterials that can resist infection. Self-defensive antibiotic-loaded layer-by-layer coatings: Imaging of localized bacterial acidification and pH-triggering of antibiotic release.